A Westminster College student and two faculty members received awards at the annual Bartramian Audubon Society Awards Ceremony on Monday, May 8, at the Jennings Environmental Education Center in Slippery Rock, PA.
Dr. Kerri Duerr, assistant professor of biology, and Mr. Brad Weaver, broadcast communication faculty, received awards for Mr. Jeffry Hall, president of the Bartramian Audubon Society, awarded Duerr and Weaver for their interdisciplinary approach to teaching “Ornithology” and “Essentials of Digital Media” in the cluster course “Tweetspeak“. 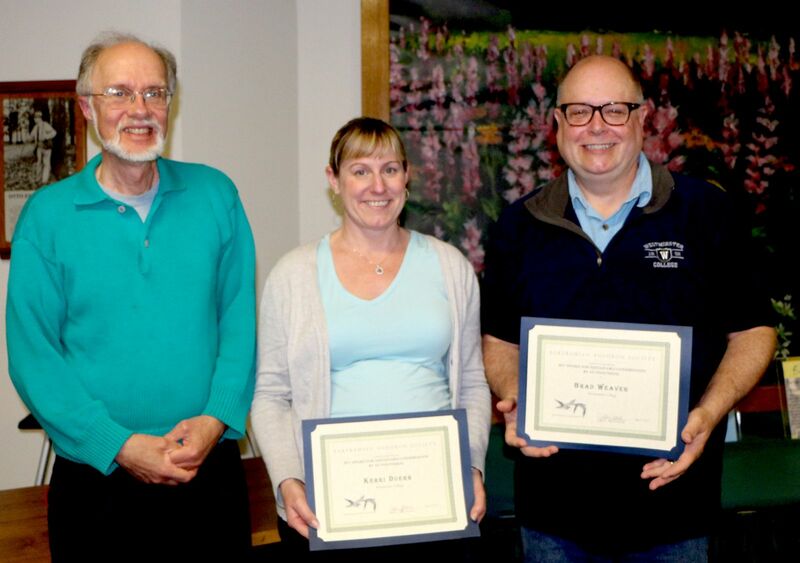 Hall praised Duerr and Weaver for their community service aspect to the course as the students successfully worked to establish the Westminster College campus as an Audubon Certified Wildlife Sanctuary. 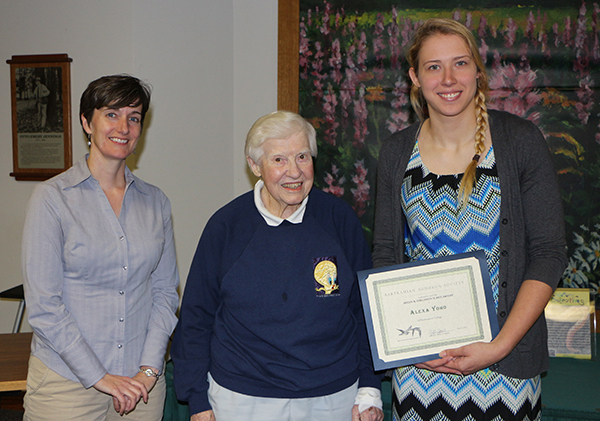 Alexa Yoho, a junior environmental science major from Coraopolis, PA, received the Helen B. Ferguson Award. The Ferguson Award is an annual scholarship given to a Westminster College student studying environmental science or environmental studies. Dr. Helen Boylan, professor of chemistry, presented Yoho with the award, recognizing her leadership in several environmental organizations including the Tiny House Team, the ALLARM outreach program, the student Green Party, and the Sierra Student Coalition.